Getting quality candidates for high-volume roles such as call centre agents, field sales agents and retail staff can be a challenge. Most jobseekers are desperate and will apply for every job they can, resulting in clogged inboxes and excessive CVs for recruiters to screen. Poorly written job specs can cause further unnecessary stress and time wastage for recruiters because they attract irrelevant applications from the wrong candidates. Writing a good job spec is an art and can save recruiters time when it comes to screening applicants. Clear and compelling job specs are particularly important for high-volume roles due to the nature of the recruitment process for these roles. High-volume roles such as call centre agents and sales agents generally have broad requirements that encourage many chancers to apply. At Giraffe we have seen it all in terms of job specs- both good and bad- and we have identified clear principles that help to attract the best applicants. Differentiating between must-haves and nice-to-haves is key to drafting a job spec. Recruiters have an idea of their ideal candidate but often this picture involves a laundry list of many nice-to-haves over and above the minimum requirements. For example, in high-volume or entry-level roles, matric is often a minimum requirement but additional qualifications or experience are preferred. In the interests of clarity, it is best to distinguish what is advantageous from what is the minimum requirement. Clearly stating minimum requirements can reduce applications from irrelevant candidates. Keep it brief! Only include the most relevant information and avoid using jargon. Keep detail to what candidates need to know and avoid ambiguity. Use of headings and short points helps to structure the spec and highlight only the most necessary points. For example, a paragraph describing the role and including the necessary skills and experience as well as required qualifications will be less clear than breaking this information into a list of key points. Remember that there will be opportunity in the interview process to give applicants further detail; the job spec is to help candidates determine their own suitability. It is important to be realistic when determining requirements for a role. For example, a candidate applying for an entry-level role will most likely not have their own vehicle and so it would be unrealistic to state that as an essential requirement. Similarly, if the role pays a low basic salary, expecting applicants to have many years of experience would be an unrealistic expectation. 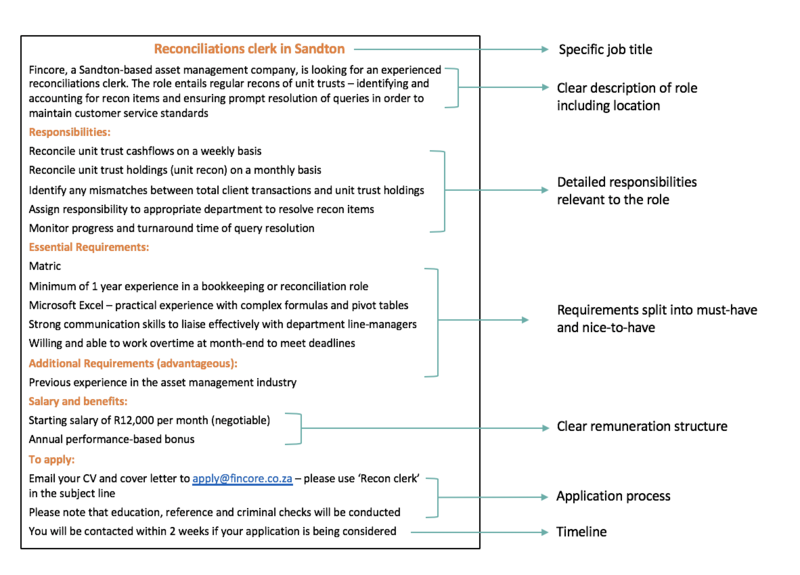 The job market in South Africa is nuanced and recruiters must have a good understanding of the day-to-day reality of the jobseeker- particularly when hiring for medium-skilled roles (those that pay between R3k and R15k per month). Recruiters should draft job specs that take jobseekers’ challenges into account. For example, many South Africans rely solely on taxis for transport. Taxi schedules can impact feasible working hours for some candidates. Staff required to work shifts or long hours may not have access to public transport at these times. If the role can accommodate flexible hours to make the commute more convenient then it should be stated in the spec. Transport issues can also impact an applicant’s decision to apply for a role. The job may not be located on a direct taxi route or it may be extremely expensive to get to the location using taxis. In such cases it may be important to include a travel allowance in the remuneration structure. Make the role sound attractive to apply for. Remember that high-volume roles are high volume for a reason and are often highly competitive with small variances and differentiation in criteria and remuneration. Roles in this space compete with each other aggressively so a job spec needs to encourage the best candidates to apply for the role instead of a similar role at another company. Aside from competing on salary, employers can offer performance bonuses, benefits, travel allowances and other non-monetary perks to differentiate. The right candidates need to be compelled to apply but unsuitable candidates also need to be discouraged. Be transparent about any potential negative aspects of the role upfront- such as night shifts or weekend work. For example if the role involves night shifts then candidates with children may not apply because they know upfront that they will be unable to work at night, whereas a job involving night shifts may be ideal for a candidate who is studying part-time. In some cases certain criteria can discriminate against candidates unfairly by listing requirements not directly linked to performing the job. For example, a job spec that asks for a candidate that is fluent in Afrikaans can exclude candidates purely based on the fact that Afrikaans isn’t their first language. Limit criteria to those absolutely necessary to perform the job to avoid unnecessary exclusion. Employment Equity (EE) roles are a case particularly relevant in South Africa where a company is looking for specific candidates and this should be stated upfront so that candidates that do not fall into that category do not apply. This frees candidates up to apply for roles relevant to them and saves recruiters from sorting through irrelevant applications. Writing good job specs can be a challenge but following these steps and putting in additional time and thought when drafting the spec can save recruiters a lot of time and hassle down the line. It is also important to remember that the purpose of a job spec is to attract the right people and potential candidates need to be seen as just that – people – with their own challenges and concerns. We hope that this guide helps you to compile great job specs that will bring in great talent. We’d love to hear what you think about this guide and if you have any other ideas or suggestions. Giraffe is reimagining the recruitment process by simplifying high-volume recruitment through technology. As innovators in recruitment we will continue to provide recruiters with tips and tools to make high-volume recruitment easy! If you want to be kept up to date with the latest insights and trends, subscribe to our mailing list below.